(KIA-POW) On 01 Dec 43 mission #85 to Solingen, Germany in B-17G #42-39781 Career Girl (360BS) PU-D. A flak burst hit one of the inboard engines. They left the formation, were losing altitude, were again hit by flak, which severed the control cables. Lt Luke ordered his crew to bail out near Lille, France. The B-17 crashed 10 km west of Lille. Lt Luke landed in soft ground while being observed by a French lady and her children. She shouted "Good Luck" in broken English. He was captured and made a POW and became the first 8th AF POW to enter Stalag 1. Lt Frank Mitchell evaded capture and served with the French underground until France's liberation. Sgt Ira Walter evaded capture for a week before he was captured and made a POW at Stalag 17B. Sgt Robert Washburn was killed by the Germans during an escape attempt. Sgt Robert Washburn landed in an open area near Carvin. He noticed a crowd of Frenchmen running towards him. He ran the other way towards a German search party and then turned towards the Frenchmen. The German soldiers shouted for him to surrender, but he kept running and the Germans shot him. He was buried in the British plot of the Lille Southern Cemetery as "Washburn RAF". His body was reburied in the Ardennes American Cemetery at Neuville-en-Condroz. Sgt Sherman G. Wright (WG) was captured on 08 January 1944 after climbing into a lory with three other evaders. The driver, a double agent, handed them over to the Germans. 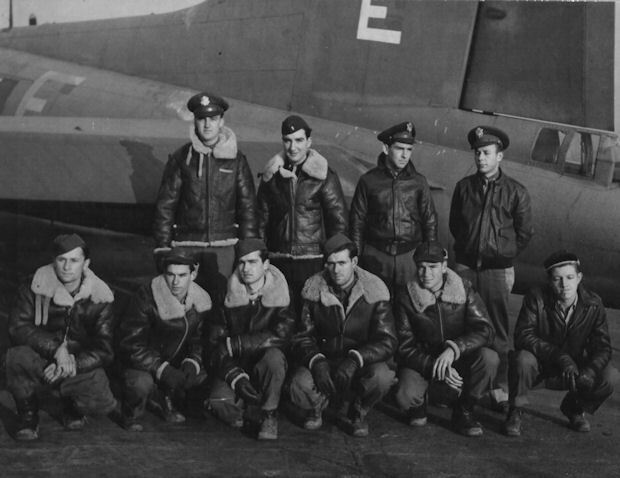 The B-17 was dismantled by the Germans and sent to the Scrap yard of the Lille-Vendeville airfield. See photographs of Stalag Luft 1 taken by George W. Luke.